In the week or so since Egypt’s military removed President Morsi from office, political scientists have shown how military coups—and yes, that was a coup in Egypt—and the reactions to them can have enduring political consequences. For the Monkey Cage, Clayton Thyne showed how international responses to coups have historically affected the speed with which elected civilian government is restored. For Political Violence at a Glance, Brent Sasley responded to dueling pieces by Shadi Hamid and Barbara Slavin to consider how the ouster of the Muslim Brotherhood might affect the strategies of other Islamist parties and groups in the region. To that roster of possible political repercussions, let me add an economic one: coups often hamper growth. That’s one of the findings from a statistical analysis I did a couple of years ago for a private-sector client who was concerned about how various forms of political instability might affect investments in poorer countries. I had already generated probabilistic forecasts of coups for the coming year, but those forecasts couldn’t tell us how much he should worry about coup risk. To help answer that, we needed to look at the effects coups might have on economic processes that more directly influence the value of his investments, including growth in gross domestic product (GDP). This isn’t a simple thing to do. It’s tempting to take historical data on as many countries as possible and compare growth rates in and after coup years with growth rates in coup-free periods, but the results would probably be misleading. The problem is that coups are much more likely to occur in a subset of cases that don’t look like the hypothetical “average” country, so the differences we’d see in a simple comparison could just as well stem from the things that cause coups in the first place as they could from the coups themselves. 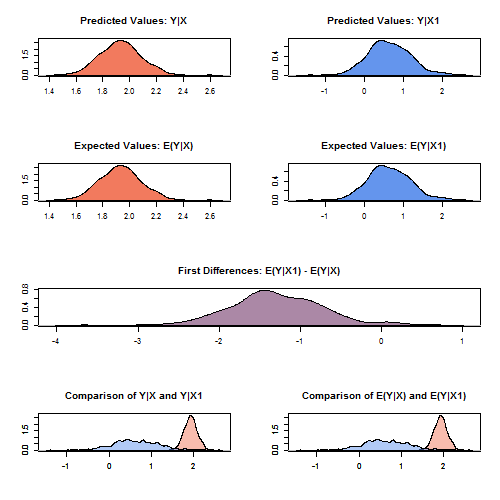 To try to get a sharper sense of how coups affect economic growth in the face of these potentially confounding factors, I used a technique called coarsened exact matching (CEM) to sift and prune the data first. As with other matching techniques, the process starts by identifying the “treatment” whose effects we want to estimate—in this case, the occurrence of a coup. In contrast to laboratory experiments, we can’t randomly assign countries to treatment and control groups that do and don’t experience coups. Instead, we have to use what we know about the things that cause coups to approximate that experimental design by sifting countries into sets that faced similar risks of coups but didn’t all have them. By carefully comparing growth rates across coup and non-coup cases within these clusters of similarly coup-prone countries, we can get a more reliable estimate of the specific effects of the coup “shocks” on economic performance than we’d get from a simple comparison of all available cases. The results of my analysis are shown in the series of charts that follow (with technical details at the end of the post). The charts summarize the distribution of estimates of the difference in economic growth rates between coup and non-coup cases. Of particular interest here are the estimated first differences, shown in purple in the middle of each set of plots. The peaks of those distributions identify the mean difference, while their spread tells us about the variance of those estimates. Of course, it’s impossible to say exactly how the coup in Egypt will affect that country’s economy, which had already stagnated badly before the army led the president away under armed guard. Reports that Saudi Arabia and U.A.E. are rushing to lend money to the post-coup government, and the rally that occurred in the Egyptian stock market immediately after Morsi was toppled, might be grounds for optimism that Egypt will avoid or at least mitigate the typical damage. Still, I think this analysis should temper any such optimism by reminding us—as if we should need it!—that coups aren’t surgical strikes which neatly cure political cancers without producing myriad consequences of their own. Now, for the technically inclined: This analysis was done in R using the MatchIt, Coarsened Exact Matching (cem), and Zelig packages. I used the Center for Systemic Peace’s list to identify when and where coups had occurred and Angus Maddison’s estimates to measure GDP growth. Coarsened exact matching was based on GDP per capita (log), Polity score (quadratic), post-Cold War period (binary), and any coup attempts in the previous five years (binary). Post-matching estimates of the effects of coups on growth were derived from a linear regression model that included all of those covariates as well as previous year’s GDP growth rate. I’m traveling at the moment and haven’t had time to post the data and R script for replication but will do so soon. UPDATE: The R script I used for this analysis is now on Github, here. The data used in that script is on my Google Drive, here. If you find any errors of have any suggestions on how to do this better, please let me know. Thank you for another one of your interesting comparative analyzes on a current relevant political phenomena. These posts are the main reason, why I am a regular reader of this blog. I have a few technical questions and suggestions. 1)	Why do you use a binary indicator (any coup attempts in the previous five years) to measure the coup-trap phenomenon? I would think that a duration variable (the time since the last coup event) would be interesting too and might even be a more appropriate measure. 2)	If I got it correct CEM is not about estimating a propensity score but balances covariates directly. However, I am not sure how to think about balancing quality in this case. As I know it from propensity score matching the quality of the new sample of treated and control cases in terms of covariate balancing is important. How does this work with CEM? 3)	I asked you about matching with panel data in the past. Some scholars question the validity of this approach, because with the country-year as the unit of analysis within country matches are quite likely. If you assume that within country matches are appropriate, because they represent different situations of a country that differ in outcome only (or mainly) because of the treatment variable it seems fine, but if you are interested in finding matches of different countries you might want to check if the matching procedure actually achieved this goal. I may have found a way to avoid this problem in the case of propensity score matching by using a conditional logit estimator. 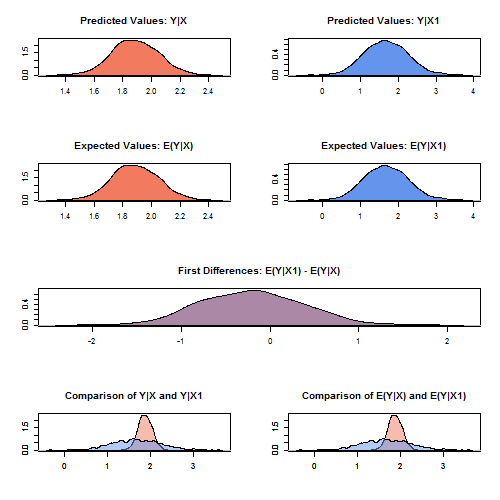 If you estimate the propensity score with a time-period variable as fixed effect, i.e. year, you essentially imposes the restriction that all matches occur within the same year, which in turn avoids matches within the same country. Unfortunately, I do not know how to implement this method with CEM. On the decision to use a binary indicator for recent coup activity, that’s the result of experimenting with various measures (including counts of tries and successes and clocks) and finding that none of the more complicated versions improves statistically on the simple one. On the issue of intra-case comparison, for this exercise I allowed it, in part because I think it’s theoretically defensible and in part because it’s a pain to avoid. Your proposed solution is an elegant one, but it also imposes some strong constraints of its own that could leave a lot of potentially useful data on the cutting-room floor. If I’m not mistaken, it’s also only really workable for matching procedures that compare pairwise instead of pool wise, like conditional logistic regression does. Ideally, I’d rerun the matching a few ways and see if the results vary substantially under different processes, but that’s beyond the scope of this post for sure. This is fascinating stuff. The high-end statistical analysis goes rather over my head, but you explain the gist of it clearly enough for a lay person to follow. The idea of modeling on RCTs is very interesting. Can you comment on the sufficiency of the sample # you were able to derive from existing coup data? What was n? Would really like to see the data to see the range of growth rates, since this seems like such an idiosyncratic process. There is a certain “duh” factor here to the notion that being in a coup state causes severe disruption and at least short-term economic damage. But I get that you are addressing commentators who may have a particular bias and pro/con agenda around the Egyptian coup. “Seven Days in May” is a must-watch to shake Americans out of smugness around this issue. I’d love to see a more contemporary updating. Sorry to take a while to reply, but I was traveling. I agree about the “duh” factor. There’s a small but venerable literature in economics that looks at the effects of coups on growth and finds it to be negative (see, for example, Alesina et al. 1986). This work really just further confirms that association and offers an estimate of the size of that effect. As you inferred, though, I thought it would still be worth reporting because of the revived talk of “good” military intervention in the wake of the (latest) Egyptian coup. As for details on the samples, I still need to get the data and code posted. In the meantime, though, I can tell you that each of the annual slices used approximately 2,000 country-years, of which about 7-8% were “treatment” cases (i.e., had coups x years earlier). As you’d expect, the economic growth rates represented in those samples varied widely. If anything, those matched samples are going to have more economic volatility than the full sample, because poor countries are over-represented in them. Thanks very much for the nice words about the blog, Danilo. You’ve rightly prodded me to fulfill my promise to post the data and code. There’s now an update at the bottom of the post with the relevant links. I’m still an amateur at this kind of sharing, so please let me know if you have trouble accessing either file. Thank you very much for your kind reply. Using Google Drive and GitHub to share your data and scripts is a great idea, everything works fine. By the way, your scripts are very good and useful. Once again, thank you for posting them online. I’m curious why you included polity squared when matching? I’m a new grad student, so I may be confused, but I thought since matching was non-parametric you wouldn’t specify your model when matching. 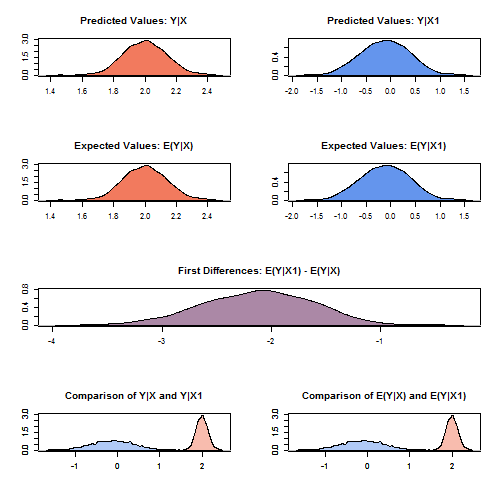 Also, I’m wondering if you tried other matching schemes, including using a propensity score? And regarding matching with panel data, could you not aggregate country level data for matching and diaggregate it prior to your regression? 1. You’re right that the square of the Polity score is unnecessary, but its inclusion shouldn’t have had any effect on the results. I used coarsened exact matching, so the addition of that term just repeats what was done with the raw score. If I (or anyone else) revises this script, though, it should be dropped. 2. I did not try other matching schemes and would think the predicted probability of a coup would be a good one to use if I (or you) did. Here, though, I thought coarsened exact matching would make for a tighter match between treatment and control cases, so I preferred it. 3. I know what you’re getting at, but the devil is in the details. Which slices of time do you aggregate or exclude and why? This is one of those thorny problems to which I have not seen a good general solution. Still, I’m not the expert on matching methods, so maybe someone else can set me straight there.